DENVER—Colorado’s dramatic gains in covering kids with health insurance have stalled—and the state could see the number of kids without insurance increase if a proposed immigration rule change takes effect. A new report from the Georgetown University Center for Children and Families shows that a decade of progress is being threatened as the national uninsured rate increased for the first time since this data has been collected due to federal lawmakers chipping away at health insurance programs. In Colorado, the percent of kids without health insurance has plummeted from 14 percent in 2008 to about 4 percent in 2016. Colorado did not see a measurable improvement in the rate in 2017. An estimated 57,000 of Colorado’s children age 18 and younger remain uninsured. The trend could grow much worse if the Trump Administration moves forward with proposed public charge regulations that would deter immigrant families from signing children up for public health coverage—even though they are eligible. The Colorado Health Institute has projected that the percent of kids without health insurance coverage in Colorado could double if the proposal takes effect. The report found that nationwide, more than 276,000 children joined the ranks of the uninsured last year, the first significant increase in a decade. The decline of coverage nationwide comes after Congress made several attempts to repeal the Affordable Care Act. Congress also expanded short-term health plans that do not have to cover essential health benefits or pre-existing conditions, and allowed funding for the Children’s Health Insurance Program (CHIP) to temporarily lapse. Miller noted that Colorado’s rate likely didn’t increase because of proactive steps by Colorado policymakers and health officials. Those include passing emergency measures to keep Colorado’s CHIP program financed when federal funds lapsed, as well as keeping Colorado’s own state health insurance exchange open for enrollment longer than the federal exchange. The nation’s many years of progress in reducing the number of uninsured children came to a halt in 2017. 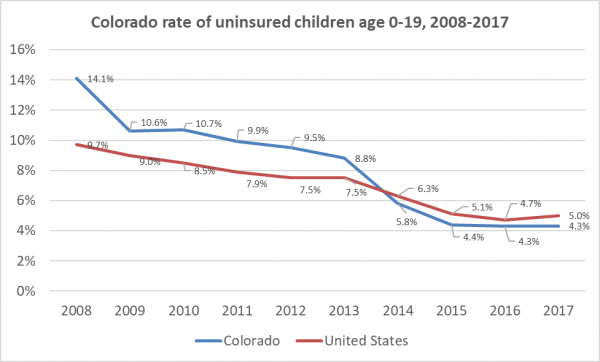 In Colorado, there was no statistically significant change in the child uninsured rate between 2016 and 2017. Colorado’s uninsurance rate for children (4.3 percent) was lower than the national average (5 percent) in 2017. This still means that an estimated 57,000 children in Colorado lacked health coverage. The Colorado Children’s Campaign is a nonprofit, nonpartisan advocacy organization committed since 1985 to realizing every chance for every child in Colorado. We advocate for the development and implementation of data-driven public policies that improve child well-being in health, education and early childhood. We do this by providing Coloradans with trusted data and research on child well-being and organizing an extensive state-wide network of dedicated child advocates. For more information, please visit www.coloradokids.org. If you would like more information about this topic, please contact Tara Manthey at 720.256.1312 or email Tara at tara@coloradokids.org.